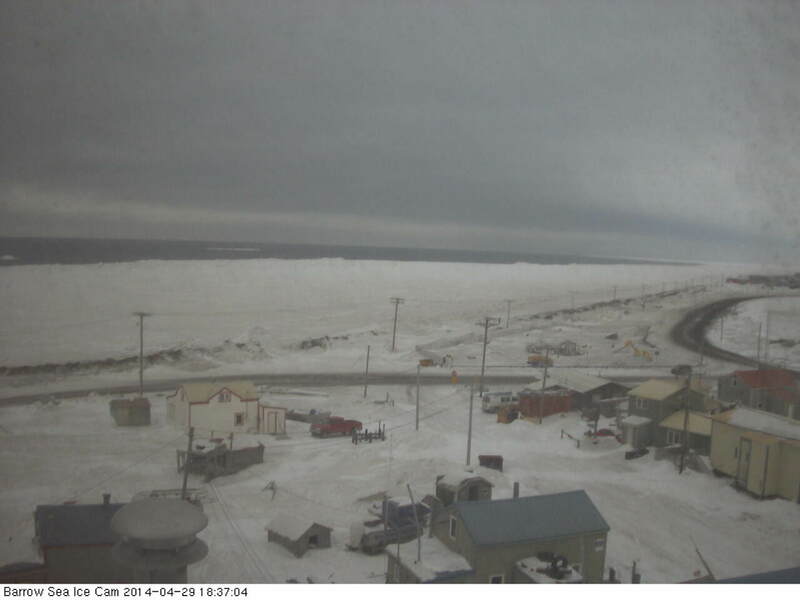 The warming trend that we provided predictive analysis for yesterday has barely even begun and we already have visible dark, open water off Point Barrow, Alaska as of late Tuesday evening on April 29. A large polynya that had opened up off the northern Alaskan coast has now extended well past Barrow and landward toward the near-shore waters. By late evening, the open water had invaded to within about 200 yards of shore along and past the Point Barrow coastline. In broader summary, the open water polynya stretches from Cape Lisburne to past Point Barrow and measures between 20 and 50 miles in width. General trends show this large polynya continuing to expand northward into the Chukchi Sea, a motion that is likely to continue for at least the next few days. Some cooling will likely return after the currently building Arctic heatwave, but it is questionable if it will be enough to result in a refreeze given the prevailing and much warmer than usual conditions. Sea ice break-up at Point Barrow typically begins in mid-to-late June. It often involves both the formation of open water offshore as well as sea ice motion near-shore. Though the polynya removed ice from the off-shore waters of Point Barrow today, the near-shore ice still remains grounded, so this admittedly impressive event cannot technically be considered a break-up. That said, it appears that we are seeing a very early initiation of melt conditions for the Barrow region. With warmer weather settling in, heat stresses to the local and regional sea ice will likely continue to ramp up. So, in other words, this early season melt event has only just begun. For many months the weather pattern has been essentially fixed. A ridge over China and Eastern Russia combined with warm air flows over Central Asia to amplify heat from Siberia and on into the Arctic Ocean. On the other side of the Pacific, a harmonic pattern involving warm southerly air flows over Alaska and Western Canada has also transported an inordinate amount of highly anomalous heat into the Arctic. These warm ridges have been consistently reinforced by high amplitude Jet Stream waves. During the Winter of 2013-2014, these same atmospheric heat transport engines collapsed the polar vortex, causing melt, avalanches, and 60 degree F temperatures for Alaska in January all while pulling Arctic air down over the Eastern United States throughout the winter months. For Alaska, Western Canada and the Eastern US, it is a general pattern that has now lasted nearly 14 months. A blocking pattern that weather historians everywhere should take note of as a general evidence of atmospheric changes resulting from human-caused warming and a validation in observation to the findings of Dr. Jennifer Francis. 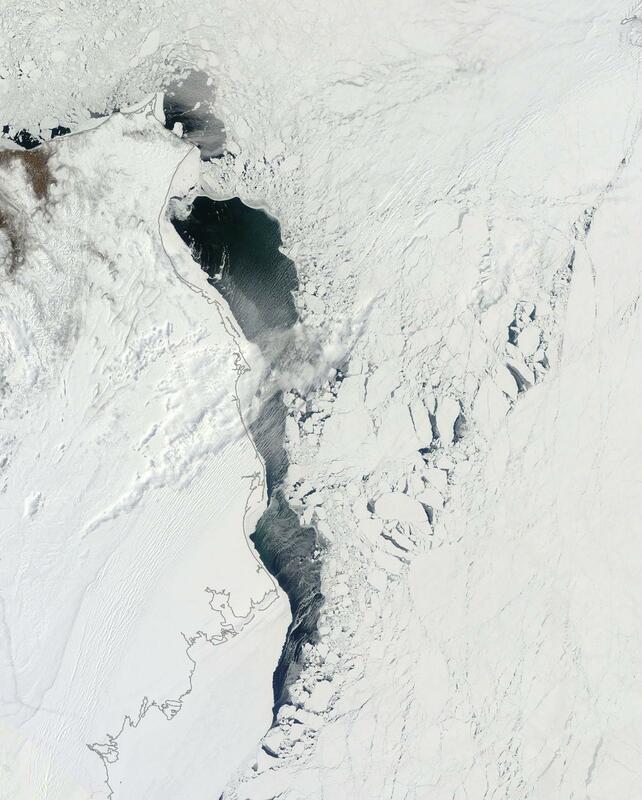 As we can clearly see in the two images above, both snow cover and sea ice have experienced severe losses in this region from April 10 to April 27. Warm southerly winds have continued to push ice northward enhancing melt as temperatures typically remained near or above -2 C (the temperature at which sea ice begins to melt) in most regions. Snow losses amplified warmer than freezing water flows into adjacent ocean basins, also enhancing sea ice losses as land masses continued to warm. Over the next six days, this general warming trend is expected to spike, bringing with it a front of much hotter than usual temperatures extending along a broad zone of the Arctic Ocean north of Canada, Alaska and East Siberia and nearly reaching the North Pole at maximum extent. Such an intense warm pulse will greatly involve the Bering, the Chukchi, the East Siberian and Beaufort Seas. It will likely most significantly impact sea ice in regions of the Bering Sea and near-shore zones of the Chukchi and Beaufort. The early season heat wave may also enhance the ice weakening process throughout the affected zone by softening the sea ice and by creating the potential for melt pond formation. During May and June, early melt pond formation can have a dramatic impact on sea ice melt much later in the season as the darker pools reduce ice sheet albedo serving as a kind of heat lens that bores down through the ice surface. Eventually, the melt ponds connect, forming larger and larger volumes over the ice face until the sea ice is almost completely overwhelmed. In the last phase, melt breaks down through the ice surface to contact the ocean. 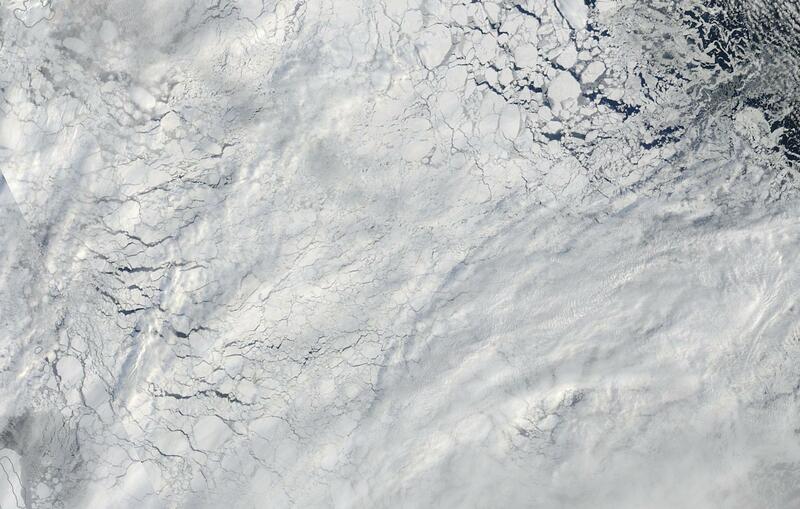 At this point, the sea ice is typically splintered into much smaller and disassociated fragments. A recent paper in the journal Nature has found that a multiplication of such early season melt ponds may well be a predictive indicator of end season sea ice extent, area and volume values come September. Our simulations show that melt ponds start to form in May, a maximum extent of 18% is reached in the climatological mean at mid-July, and there are hardly any exposed ponds left by mid-August. The strong interannual variability and the positive trend are striking. Whereas in 1996, the year with the highest September ice extent since 1979, the maximum pond fraction reaches only 11%, in 2012, the year with the lowest September ice extent, up to 34% of the sea ice is covered by ponds. Neven over at the Arctic Ice Blog recently provided an excellent assessment of the impact of melt ponds which is available here. The most recent hot pulse for this region may just be the first of many as the spring and summer melt season progresses. Jet Stream patterns continue to remain fixed, delivering much hotter than normal temperatures throughout the Western Canadian, Alaskan, and East Siberian regions. Furthermore, snow cover losses for these regions are particularly well advanced further enhancing the likelihood of warm air invasions from these rapidly heating continental zones. Anomalously large and extreme early season fires may also result in a degree of albedo loss as smoke and soot is drawn northward to darken both remaining snow cover and sea ice. As such, this zone represents a kind of sea ice Achilles heel as the 2014 melt season progresses. 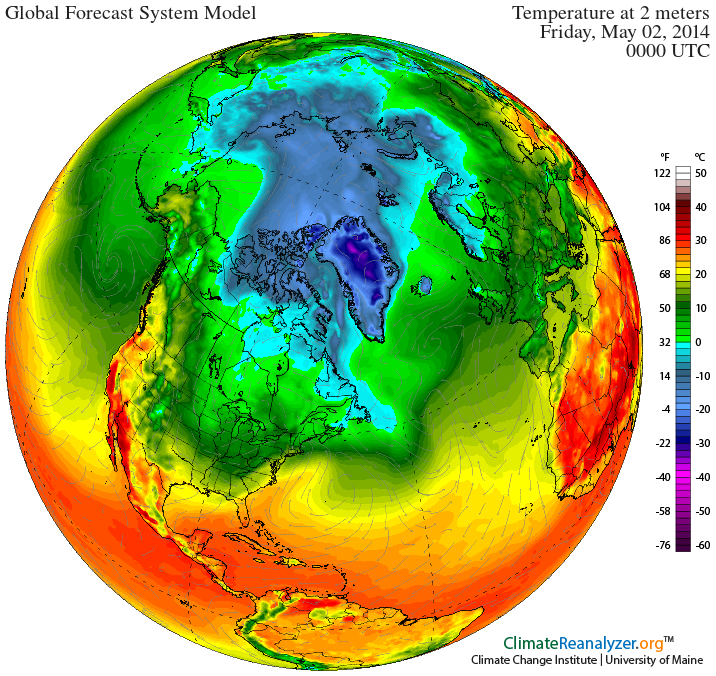 If we do see major losses and a progression toward record melt, it will likely come as a result of extreme weather patterns emerging from the continental zones spanning East Siberia, Alaska and Western Canada. What we are currently witnessing is something that should never happen — an outbreak of fires with summer intensity during late April at a time when Siberia should still be frigid and frozen. Last year, during late July and early August, a series of epic wildfires raged to the north and west of Russia’s far eastern Amur region. About a week later, the skies opened up in a ten-day-long deluge that pushed the Amur River bordering Russia and China to levels not seen in the entire 150 year span of record-keeping for the region. Whole cities were submerged as the Amur leapt its banks to form a kind of massive inland sea. The floods promoted strong growth in the region, penetrating permafrost zones to enhance melt, providing major fuel sources for fires should they re-emerge. Come winter, a persistent warm ridge pattern in the Jet Stream transported hotter than usual air over this region. The winter was far, far warmer than it should have been. And when spring came, it came like the onset of summer. Last week, temperatures soared into the 70s and ever since the beginning of April, freakishly large fires for so early in the burn season erupted. By April 23rd, the Russian fire ministry had logged nearly 3,000 fires. The outbreak was so intense that, just a few days ago, more than 5,000 pieces of heavy equipment and an army of firefighters were engaged throughout a large stretch of Russia from the still frozen shores of Lake Baikal to the far eastern Amur region. 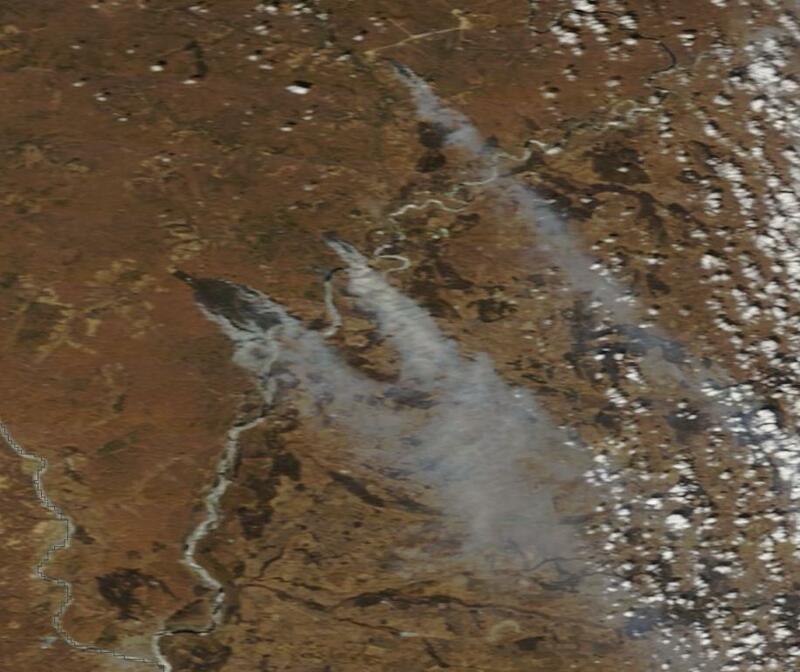 Two massive burn scars devouring huge sections of land in the Amur region of Russia. For scale, the ribbon of blue traveling north to south beneath the first massive fire is a mile-wide tributary to the Amur river called the Zeya. Using the scale provided by LANCE MODIS, we see that the fire at upper left is currently about 15 x 18 miles (270 square miles) in area and that the fire at lower right is about 23 x 20 miles (460 square miles) in area. Even during Russia’s recent global warming-spurred epic fire seasons of 2010 to 2013 fires of this scope and obvious visible intensity didn’t come up in the satellite imagery until the most intense periods of summer heating during late June through early August. 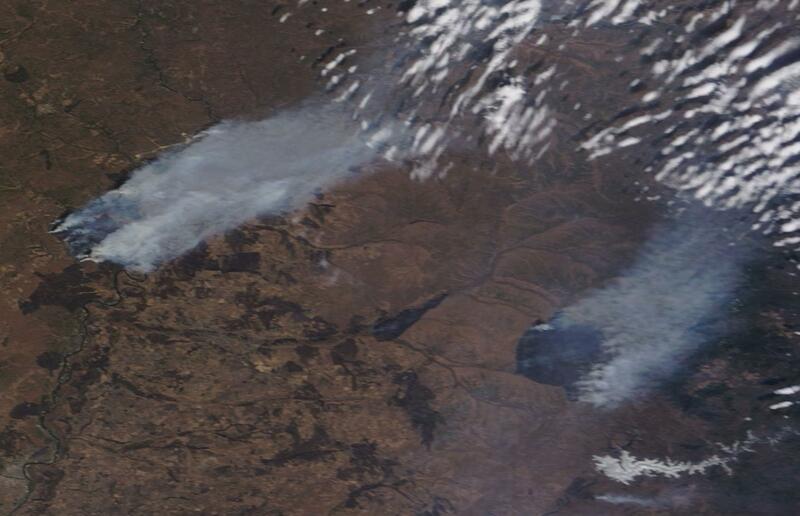 Today, we have monster fires comparable to those which burned during Russia’s worst ever recorded fire seasons, at their height, burning next to snow covered regions in late April. 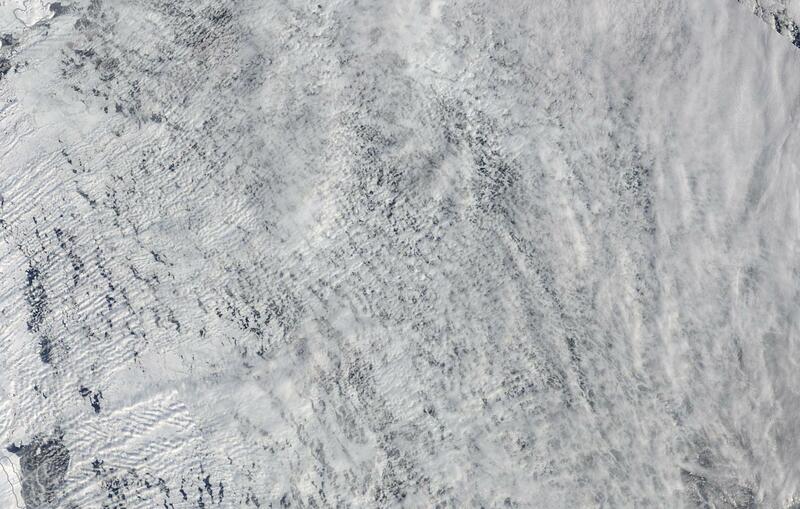 As a last reference, look at the ice covered river in the far lower right corner of the above image. That swatch of crystalline white — yes, it’s a large estuary apparently being dwarfed by the massive fire burning just above it. Beneath wide body of still frozen water is what appears to be a ‘small’ plume of smoke. It’s worth noting that this smoke plume issues from a recently burned region covering fully 15 square miles. By comparison, the fires above each cover areas comparable to Guam, half of Rhode Island, or the massive ice island recently broken off from the now doomed Pine Island Glacier (PIG) — B31. 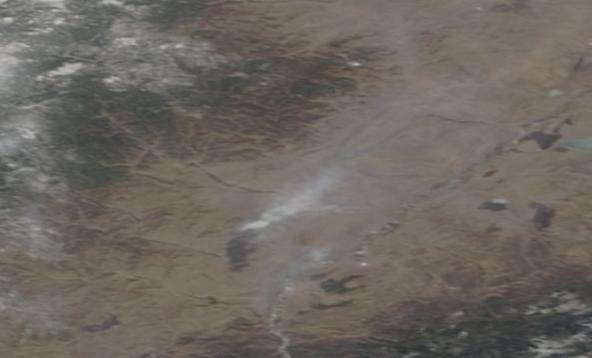 Unfortunately, these massive fires aren’t the only blazes covering extraordinary swaths of Russian land during late April. 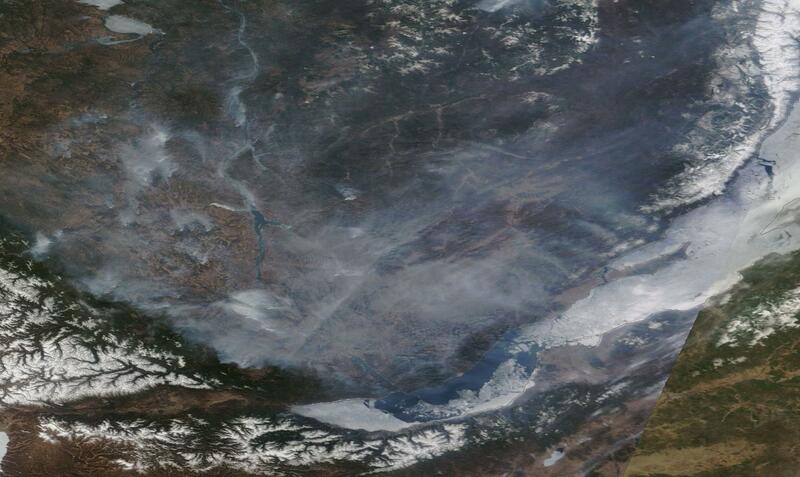 Moving west to the shores of the still partly frozen Lake Baikal, we find numerous fires burning beneath a sea of smoke in the lowlands between two, still snow-capped highlands. The entire roughly 200 x 200 mile (40,000 square mile) region is covered by the steely gray smoke of previous and ongoing blazes. Peering down through the dense shroud, we see numerous thick smoke plumes issuing from still out of control fires. 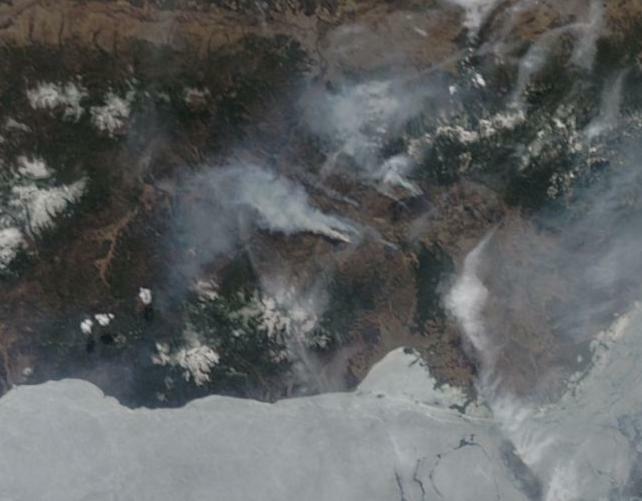 The freakish prematurity of these blazes is readily apparent in the visible ice still covering much of Lake Baikal and also in the snow still doggedly clinging to the nearby mountainous highlands. A vicious combination of thawing permafrost, a rapid increase in average temperatures throughout Siberia and driven by human warming, and the vulnerability of the active soil layer and related vegetation to rapid drying appears to be turning this region into an ever more explosive fire trap. Risk of wildfire is dependent on both heat and fuel. But with the permafrost containing an almost inexhaustible layer of either drying peat or venting methane and with temperatures now rising at twice the already rapid global rate, the potential for burning in or near the violatile permafrost thaw zone may well be practically unlimited. These extraordinary and anomalous conditions, combined with a very intense early season warming, what appears to be a persistent and developing heat dome over Eastern Russia and adjacent Arctic Siberia, a very rapidly receding snow line, and, potentially, an amplifying effect from an emerging El Nino in the Pacific, results in a very high continued risk for both extreme and record fires throughout the spring and summer of 2014. 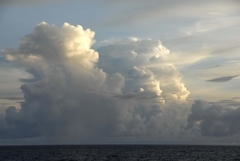 The ocean-atmosphere system might well be described as an intricate pirouette between the forces of heat and moisture. Warming and cooling over the ocean and atmosphere alter the rate at which rains fall or lands dry. This interplay, called the hydrological cycle, is a primary governor the world’s weather, playing an integral part in both storm formation and dry spells alike. As the Earth has warmed by about .8 degrees Celsius since 1880, this cycle of evaporation and precipitation, of drought and deluge at the extremes, intensified by about 6% on average. But this increase was uneven, pushed to even greater abnormalities when both the Earth’s atmosphere and ocean surface experienced periods of either strong warming or relative cooling. It was from this combined uneveness and overall warming trend which arose a number of increasingly severe and dangerous weather events. Most recently, on April 22nd, global ocean surface temperatures hit a very high +1.12 degrees Celsius above average temperature anomaly (vs the 1979 to 2000 average). This warm pulse pumped both heat and moisture into the world climate system. During recent years, major ocean warming episodes have coincided with intense periods of extreme rainfall and drought around the globe. So when anomalies hit severe levels last week, risks rose that atmospheric rivers of moisture and related extreme rainfall events would intensify. The result was a three-day-long rain event that destroyed over 2,000 homes in North Afghanistan impacting 10,000 families and resulting in the loss of 180 souls. Severe losses also extended to crops and livestock over a broad region of this Central Asian state as victims were forced to abandon farms and villages. Jawzjani’s pleas for assistance were echoed by local government officials throughout the stricken region as many more people remained isolated and without immediate help. Afghanistan’s rugged terrain is particularly vulnerable to intense rain events. High volumes of rainfall channel through steep ravines and build up into large, wave-like flood pulses in Afghanistan’s heavily populated valleys. Low-lying homes constructed of mud and rock also often lack resiliency and are in danger of either collapse or inundation during severe storms. As the Earth continues to warm under a relentless human greenhouse gas forcing, it is likely that both severe drought and rainfall events will continue to grown in frequency and intensity. Unfortunately, it is those who are most vulnerable — the poor and those who have contributed the least to the rapidly intensifying climate shock — who will bear the first and heaviest impacts. Though these words were spoken in the noble pursuit of the most just of causes by Dr. Martin Luther King many years ago, they have lost none of their potency or relevance. For though those facing economic and social oppression have been justly elevated by the actions of the equality movement Dr. King so eloquently spoke for, we are now in the process of consigning ourselves and our progeny to an entirely different but no less brutal kind of oppression. A world where danger, difficulty, severe environmental hazard and poverty will come as a result of our failure to make the right energy decisions now. It is a brutal kind of generational theft in which the current wealth of some is dependent on the enslavement of our own children to the spite of a barren and violent world. A world that could best be seen as a curse. A world of rising seas, expanding deserts, of scarce water, of ruined and abandoned cities, a world where the oceans themselves vent poison gas. That we could set ourselves on such a path requires the very worst kind of social blindness. A zombie state of denial in which we have willfully hidden our faces from the ever-more-visible harm we are causing. For we must be in such a state to even consider the continued use of the dirty and harmful fuels. For we must be lost if we do not understand the pain we will surely inflict on future generations and even ourselves as we inflame our world to conditions not seen in 10 million, 55 million, or 250 million years. As we, with each lighting of a fossil fire, invoke the names of past great extinctions: Eocene, Jurrassic, Permian. There is no excuse for keeping on this path. No justification for the harm that would surely come from our continued burning. No rationale that could lend credence to ensuring our world becomes a place of Great Dying. On March 22, 2013, a call was made for Fossil Fuel Abolition. Only a few have listened. Some, like the nation of Scotland, have pledged to pursue a true construction of that enlightened ‘City on a Hill,’ by harnessing the glorious blaze of solar radiance or the whispering winds of our world. So I ask, why not America? Is Scottland to boldly lead in the turning away from the path of harm? Is it for America to come up with a vile excuse not to follow? To delay and to therefore cause more harm? Some among us have turned their face from environmental oppression and asked others to follow. James Hansen, Rachel Carson, Bill McKibben, Joe Romm, Chris Hayes and ever so many more. Yet others dissemble, making false claims, providing rationales for escalating violence. So, in this most desperate hour, we are a house divided. Divided into those who serve a future in which humankind can rationally live and those who serve the Destroyers of the Earth. This is an unconscionable state and it cannot stand. So the call must again go out. Science has confirmed it. Human-caused warming is killing Antarctica’s massive Pine Island Glacier (PIG). And this week’s release of a chunk of ice larger than Guam into the southern ocean is just one of the many major losses that will occur as part of what is now an inevitable demise of one of the world’s greatest glaciers. As human greenhouse gas emissions caused the world’s oceans to warm, upwelling currents delivered a portion of that heat to the continental shelf zone surrounding Antarctica. A fortress of ice, numerous glacial ice shelves thrust out from this frozen land and drove deep into the sea floor. 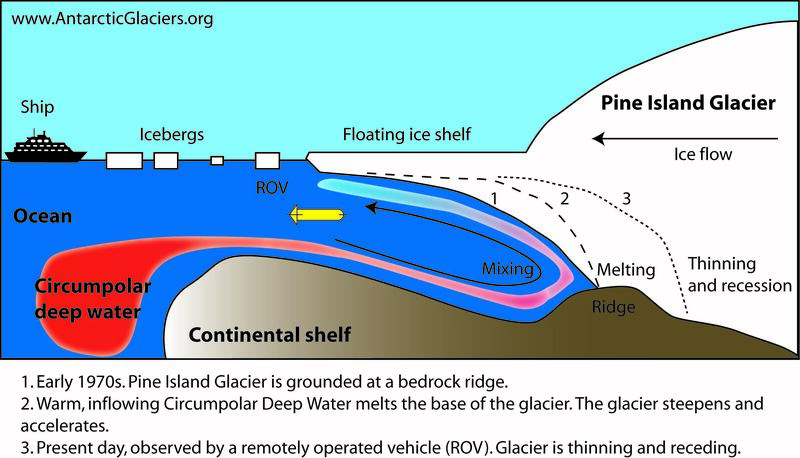 Ocean-fronting glaciers featured submerged sections hundreds of feet below the sea surface. The warming currents encountered these massive ice faces, eroding their undersides and providing pathways for ocean waters to invade many miles beneath the glaciers. These invasions subjected the vulnerable ice shelves not only to the heat forcing of an ever-warming ocean, but also to wave and tidal stresses. The reduction in grounding and the constant variable stresses set the glaciers into a rapid seaward motion. Antarctica’s most vulnerable glaciers lie along its western out-thrust. Two, Thwaites and the Pine Island Glacier, have recently seen very rapid increases in forward speed. Of these, the Pine Island Glacier, according to a recent study, is undergoing the process of an irreversible collapse. What this means is that the glacier’s speed of forward motion is now too great to be halted. Inevitably, even if the climate were to cool, the entire giant glacier will be launched into the world’s oceans where it will entirely melt out. The Pine Island Glacier is massive, covering a total area of 68,000 square miles and, in some locations, rising to over 2,000 feet in height. It represents 10% of all the ice in the West Antarctic Ice Sheet, holding enough liquid water to raise sea levels by between 1 and 2.5 feet all on its own. And the now destabilized PIG is bound to put added stresses on the adjacent Thwaites glacier together with almost the entire West Antarctic ice system. Over recent years, PIG’s forward speed has accelerated. Increasing forward velocity by 73 percent from 1974 to 2007. Surveys made since that time show an even more rapid pace. By January of this year, studies were finding that PIG had entered a sate of irreversible collapse. So it is little wonder that enormous chunks of ice are breaking off from this massive glacier and drifting on out into the Southern Ocean. As of early this week, the immense ice island dubbed B31 measuring 12×24 miles in size (nearly 290 square miles), slid off its temporary grounding on the sea bottom and began its journey out into the Southern Ocean. There it will remain for years, plaguing the world’s shipping lanes as it slowly disintegrates into a flotilla of icebergs. It is just the most recent event in the now ongoing decline of PIG. And we can expect many, many more major ice releases as this vast Antarctic glacier continues its dive to the sea. Anomalous, global-warming-enhanced, fires continued to erupt across Eastern Russia this week, chasing a rapidly receding freeze line north and into zones still frozen, but starting to shake off ice cover far too soon for comfort. According to reports from Radio Free Europe, more than 5,000 pieces of heavy equipment and many more firefighters are now battling blazes throughout Siberia this week. As of April 20th, more than 100 blazes were reported in numerous regions including: the Orenburg area around Lake Baikal, the Amur region, the Birobidzhan Autonomous Oblast, the Primorsky Krai, and the Far Eastern region of Russia. The fires come as temperatures ranging from 5-18 C above average continued throughout a region that has experienced hotter than normal temperatures all winter and on into spring of 2014. For example, the average April high temperature for the region of Lake Baikal is typically a frigid 28 F, while this week is expected to see highs in the lower to middle 40s. Further east, the temperature extremes are more radical. In Amur Blagoveshchensk, the average low is about 27 degrees F for this time of year, the average high, about 50. But today the low was 52 and the high is forecast to be 78 — 25 and 28 degrees above average respectively. All across Eastern Russia, the story is the same: above average warmth, early thaw, summer-like temperatures in spring time. It has been this way day after day, month after month. Since 2010, the story has mostly been the same: early thaw, record or near record heat, amazing fire hazard. Even more concerning, the situation is steadily growing worse. Winters during cold regions are typically comparatively dry events. Though snows may pile up, the water content of the snows amount to much less moisture than it would seem. During spring, a gradual thaw ensures this moisture keeps the thin, top layer of soil above the permafrost (called the active layer) from drying out too rapidly. Typically only inches to a few feet in depth, this layer is far more susceptible to drying than a deeper layer with access to greater moisture sources at depth. But only frozen or melting permafrost currently rest below the active layer, creating a moisture barrier or worse — adding a potential fuel source for wildfires. In years of warmer than usual temperatures, as has happened more and more often under the current regime of human-caused warming, the thaw occurs rapidly and the active layer quickly dries out. This loss of moisture amplifies into a kind of tundra drought that can block atmospheric moisture flows and prevent rainfall, compounding the drying problem until the more energetic storms of summer arrive. In addition, expanding zones of thawing permafrost provide two added fuel sources for wildfires. Tundra melt in high water content areas forms into wet thermokarsts, mires or melt ponds that vent methane gas in high enough concentration to burn. Tundra melt that rapidly dries after thaw forms into a peat-like basement layer that can burn and smolder for long periods once ignited. 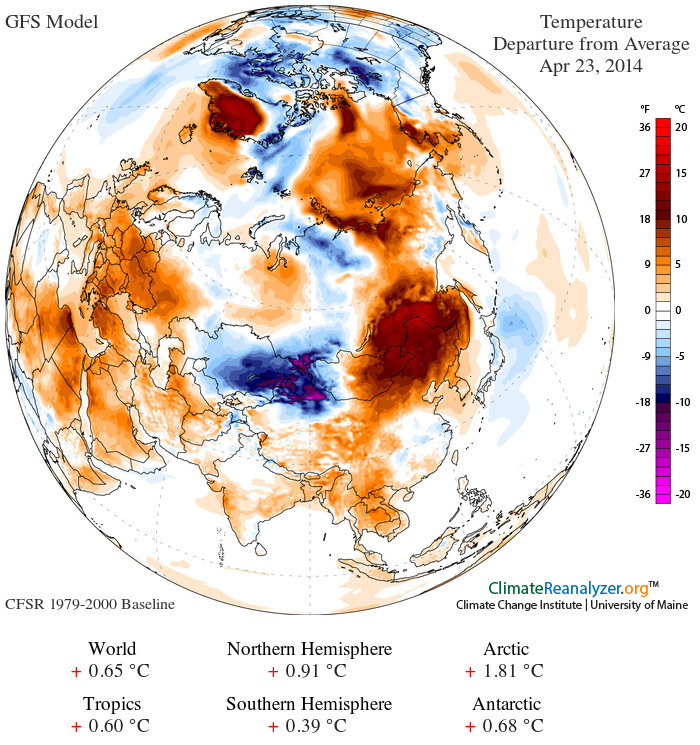 On average, temperatures have been rising by about .4 C per decade throughout Siberia. So almost every spring now falls into what would typically be called a hot year. In addition, amplification of Jet Stream wave patterns deliver proportionately more heat to regions in the up-slope of these high amplitude atmospheric pulses, forming hot, high pressure ridges. And this year, the heat ridge has consistently formed over China, Mongolia and Eastern Siberia — the region of the current large fire outbreaks. As a result, what we are seeing is an extraordinary outbreak of intense wildfires directly adjacent to still melting snow and frozen lakes. A surreal event that reminds one of the ever-at-war frost and fire giants of ancient Viking legend. But these giants, the fire giants at least, are a direct result of an ongoing and ever increasing human-caused heating of our world. 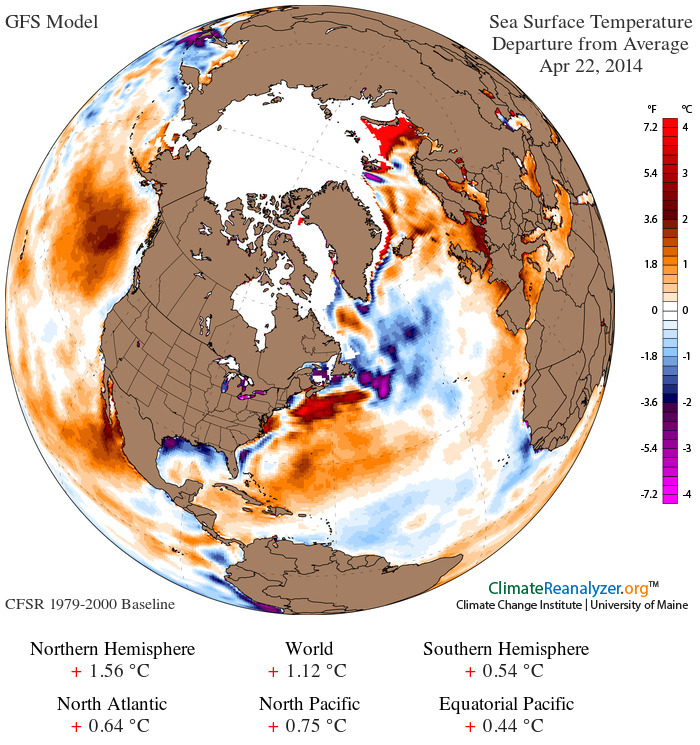 With the ever-more certain approach of El Nino, the world ocean surface is starting to radiate more and more heat. Over the past four days, GFS assessments have shown positive temperature anomaly values in excess of +1 degrees Celsius (C) above the, already hotter than normal, 1979 to 2000 average (which was, itself, about .5 C above the low averages seen during the period of 1880 to 1920). With each new dawn, readings ramped higher and, by today, those temperatures had spiked to an extraordinary +1.12 C hotter than ‘normal’ for the entire global ocean system. The equatorial Pacific region hovered near El Nino values with readings of +.44 to +.45 C approaching the El Nino threshold of +.5 C. It is worth noting that the Eastern Equatorial Pacific has consistently shown below average temperatures during recent years as strong trade winds drove both upwelling of cooler waters and atmosphere-to-ocean heat transfer. Meanwhile, the Western Pacific spiked to much hotter than normal readings as heat content just kept piling up in a broad zone east of the Philippines. Extraordinary high temperature departures have also cropped up across other regions. The Northern Hemisphere, for example, showed an extraordinary +1.56 temperature anomaly for April 22. This exceptional reading was fed by extreme northern ocean temperatures in the Barents Sea above the Arctic Circle at +4-5 C above the 1979 to 2000 average and a very warm pool in the Pacific Ocean south of Alaska ranging from 1.5 to 2.5 C hotter than normal. Aside from these zones of extreme heat, almost all Northern Hemisphere waters now display hotter than average temperatures. The likelihood of El Niño remains high, with all climate models surveyed by the Bureau now indicating El Niño is likely to occur in 2014. Six of the seven models suggest El Niño thresholds may be exceeded as early as July. At issue is the fact that reversals of the trade wind, known as west wind back-bursts (WWB), are currently ongoing both east of the Solomon Islands and in the Central Pacific Ocean. Real-time observation of western Pacific wind flow through composite weather model data shows a broad field of westerly winds of about 5-15 mph velocity centered at 1.7 degrees South, 156 degrees East. A second cyclonic circulation north of Tahiti at 2.9 North, 139 West in the mid Pacific Ocean has also generated a 5-15 mph west wind. Overall, these counter trade wind flows help to push down-welling warm water in the Western Pacific eastward, spreading hot waters across the surface and amplifying the force of what, during March, was the most powerful Kelvin Wave on record. Factors that bring with them the potential for an extraordinarily powerful monster El Nino for 2014-2015, continued positive ocean surface temperature extremes, and major weather disruptions associated with both human warming and the global tilt toward the warm extreme that is El Nino. A vast swath of sea ice that painstakingly formed as somewhat cooler conditions had finally settled in near Svalbard and Frans Joseph Land in the Barents Sea was shattered yesterday as a powerful, heat-laden Arctic cyclone screamed up out of a rapidly warming extreme North Atlantic. The storm originated west of the Norway coastline where, in recent years, a repository of exceptionally warm water has collected. This near-Arctic and Barents Sea warm pool has resulted in numerous effects including a forced recession of sea ice by hundreds of miles during winter time as well as providing impetus for various anomalous heat waves in Scandinavia in recent years. This time, the heat pool was the genesis for a powerful storm that delivered an intense package of early season warmth to a section of sea ice drifting in the North Barents Sea region. 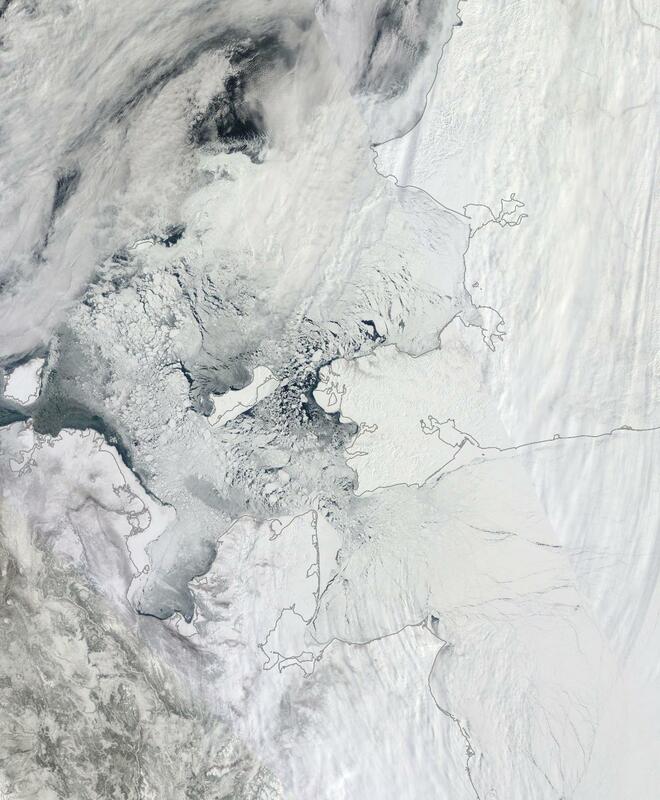 In the above image, provided by NASA’s LANCE-MODIS sensor, we can see a 250 mile section of sea ice that had extended out into the Barents Sea over the past few weeks during a cooler period as warmer conditions shifted to the Laptev, East Siberian, and Beaufort Seas. The date of this shot is April 16. To the lower left is the tip of Svalbard. Upper left is the far edge of Frans Joseph Land. Another few hundred miles to the right of far right frame is Northern Norway. The storm, for now is off frame. 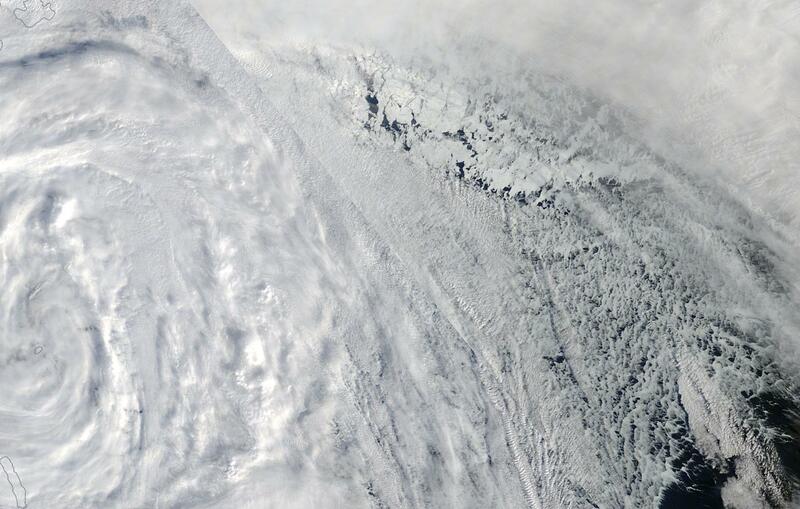 Now on April 17, we can see the storm center in the far left frame near the tip of Svalbard. At this point, the storm has bombed out to an extraordinarily powerful 950 mb low, packing 60+ mph winds. In its upper quadrant, it carried with it temperatures ranging from 10 to 20 C above typical seasonal averages. Perhaps more importantly, through cyclonic forces it pumped waters that were up to 5 C above average temperature up from the depths and into the ice pack. This kind of cyclonic Ekman Pumping, in recent years, has had an increased potential to rapidly reduce sea ice due to warmer surrounding water conditions and warmer waters at depth. Note that rapid sea ice disintegration is already involved in the wake of this severe Arctic Cyclone. Now, today, on April 18, we can see that in the aftermath of this powerful Arctic Cyclone there is very little contiguous sea ice left. What remains is what in sea ice parlance can be termed nilas — very thin and diffuse ice of 0-10 centimeters in thickness. Note that the entire 250 mile zone is completely involved in this very visible ice loss and that such losses continue on past Frans Joseph Land and into the Kara Sea. 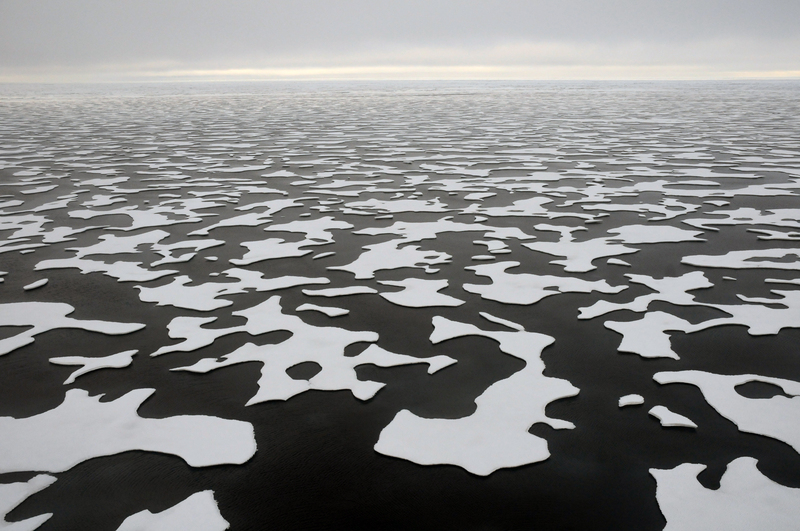 Melt season in the Arctic is now well involved. In addition, we have numerous weaknesses in the Northern Hemisphere Jet Stream that continue to funnel much warmer than average air over the Arctic Sea Ice. Alaska, Siberia and the Barents all continue to see strong warm air impulses that progress well into the zone covered by sea ice. Today, according to GFS model measures for the zero hour, average Arctic temperatures are 2.24 C above the, already warmer than normal, 1979 to 2000 average. This is a rather high spike for spring, when Arctic temperatures typically start to settle back down after seeing high levels of global warming associated heat amplification during winter time. 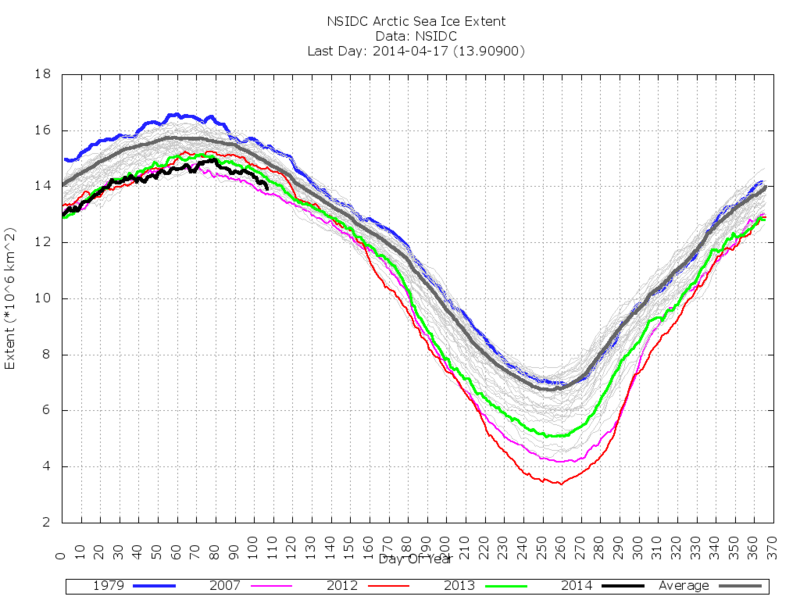 The excess heat had already pushed Arctic sea ice extent measures down to near record lows as of April 17. According to NSIDC, extent measures had fallen to 13.9 million square kilometers yesterday, the second lowest level in the measure. With full effect from the recent intense storm not yet fully realized, it is possible that impacts in this region alone could reduce total values by at least 100,000 square kilometers. Yet one more major blow to sea ice from a powerful warm storm type system. And, in this case, with melt season progressing rapidly and with so much heat already shifting into the Arctic, it is highly unlikely that this zone of newly dispersed ice will see much in the way of recovery over the coming weeks. Methane Monster Finding Cracks in Earth’s Defenses: Is the Global Methane Sink Starting to Fade? Annually, humans emit about 13.5 gigatons of carbon, or about 50 gigatons of CO2 equivalent gasses into the atmosphere. The measures are essentially the same — one just counts carbon weight, the other counts out all the additional hydrogen, oxygen, nitrogen or other atoms together with the carbon. 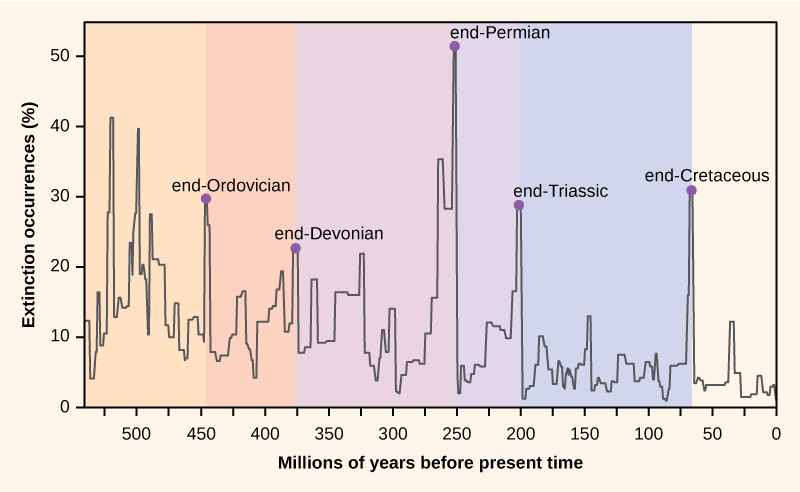 Of this massive volume, a volume at least six times the emission seen at any time in the geological past, even during the worst greenhouse gas extinction — the Permian — only a fraction remains in the atmosphere for any substantial period of time. This fraction continues to trap the heat and cause the effects we now see on a daily basis — extreme weather, record droughts, fires, floods, crop damage, sea ice loss, storms and an incessant rise in global temperatures. The rest goes into what we call carbon sinks or stores. Through the course of human-caused warming, scientists have been concerned that carbon sinks and stores will eventually fill up or, even worse, become emissions sources themselves. The result would be that a greater fraction of the human greenhouse gas emission would remain in the atmosphere longer and do even more damage through its now increased warming potential as natural sources began to emerge and multiply. It is this kind of amplifying feedback that we’ve been sounding warnings on since 2012. And, according to new scientific research, there is serious reason for concern that another amplifying feedback in the form of erosion of the methane sink is now starting to develop coincidentally with rising rates of natural methane store emissions. As a molecule, methane is an extraordinarily potent heat trapping gas. If CO2 were the tortoise — persisting for hundreds or thousands of years and gradually and inexorably building up a potent heating force, methane is the hare — providing a very intense burst of heating potential for a short period before being sucked out of the atmosphere by either the hydroxyl sink in the tropopause or through interaction with the soil. The hydroxyl sink lives as a thin layer of a detergent-like molecule consisting of one oxygen atom and one hydrogen atom (HO). The layer exists along a boundary between the troposphere and the stratosphere called the tropopause. It forms when Nitrous Oxide (NO2) encounters Ozone (O3) and water vapor (H2O) at a height of about 8-10 miles where solar radiation is of a wavelength shorter than 315 nanometers. The radiation energy sets off a reaction between these three molecules producing a layer of hydroxyl, a reactive compound that breaks down all sorts of nasty chemicals floating around in our atmosphere. It also breaks down methane. A service that is quite valuable, especially when you consider that methane’s heat forcing, without the rapid oxidization powers of the hydroxyl layer, would be far, far greater. The heat potential of a single methane molecule is 80 times that of a single CO2 molecule (in the presence of aerosols, it jumps to 105 times that of CO2, somewhat reducing the aerosol cooling effect). And so it’s probably a good thing that the lifespan of a methane molecule in the current atmosphere is only about 8 years. In contrast, CO2 lives about 500 years before weathering or the deep ocean finally knock it out. As a fraction of total greenhouse gas forcing, scientists conservatively calculate that the total methane overburden represents about 60 parts per million of additional CO2 equivalent heat forcing or a little more than half the total additional heat forcing from CO2. But this calculation takes into account the notion that methane is short lived and will tend to drop out, resulting in relatively less methane heat forcing over time. And so it is that today we encounter a bit of a problem. For it appears that a large hole has now been blown in the methane/hydroxyl sink over the Pacific Ocean. 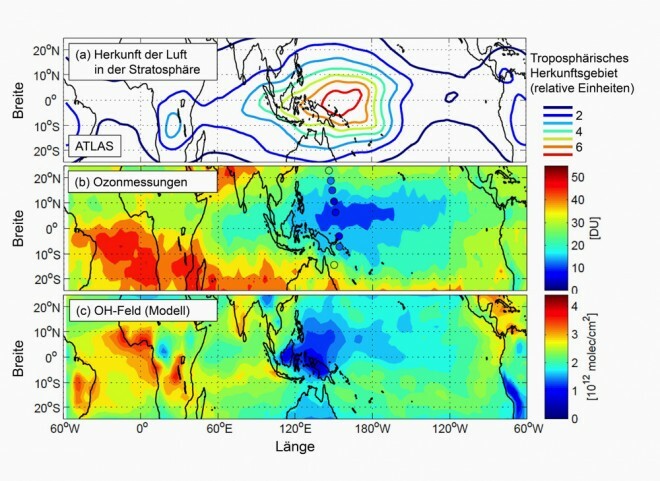 Though the cause of the current hole is unknown, what is known is that powerful thunderstorms in the region provide atmospheric lift and could have mixed in ozone destroying chemicals such as bromine and chlorine that significantly reduced one of the key constituents of hydroxyl formation. The hole is quite large and while the initial paper by Markus Rex primarily noted concerns about additional volatile chemicals reaching the stratosphere through the hole, these major hydroxyl reductions over such a large area are also likely to lengthen the atmospheric lifespan of methane. This feedback may well be a result of other human pollutants and have a possible negative effect on global warming by acting to significantly degrade a major carbon sink. If such an instance is confirmed, it may well be the first such case of its kind where two separate subsets of pollution create a kind of harmonic, but indirect, warming potential effect. In any case, not a good outcome. A second very large methane sink/store is encompassed by the world’s vast swaths of wetlands. There, organic materials in the wetlands soil bind electrons needed by methane producing bacteria during regular wet-dry cycles, preventing a portion of the organic material from being broken down as methane. In essence, it’s a kind of indirect methane sink in that it prevents carbon-based materials from being converted to methane by already active methane producing bacteria. But new research conducted by a team of Swiss and German researchers has found that as climate warms, wetlands are increasingly submerged, and large regions of tundra wetlands thaw, the electron binding process tends to run in reverse even as more wetlands become available for methane emission. In essence, warming both submerges more wetlands even as it generates more wetlands due to tundra thaw. It’s a kind of one, two punch that these researchers are saying could push global methane production radically higher. As a result, the very large organic carbon store contained in wetlands would increasingly be emitted as methane and the wetlands would act less and less as a methane sink and more and more as a venting methane store. The new addition of wetlands from melting tundra only compounds the process. Researchers found that wetlands are likely to emit between 10 and 165% more methane due to these combined impacts. It’s worth noting that global methane emissions from wetlands are currently about 165 teragrams (megatons metric) each year. So the new research estimates that annual emissions from these sources will increase by between 17 and 260 megatons annually. By comparison, the total annual methane emission from all sources (including the human addition) is about 600 megatons each year. These new discoveries — the formation of a hydroxyl shield hole and the recent study finding that global warming will lead to a greater annual release of methane from the world’s wetlands — are likely to combine with ongoing human methane emissions that are now radically increased due to hydrolic fracturing for new gas deposits and with potentially increasing methane emissions from subsea sources such as worldwide stores of methane hydrates and the very vulnerable methane stores in the East Siberian Arctic Shelf. The result is a much greater risk that current methane levels will rise and/or remain high for longer than expected. In total, it’s a significant risk of additional major warming on top of an already very powerful heat forcing coming from a rising human CO2 emission. Hat Tip to Colorado Bob! Likelihood for a significant El Nino later this year continued to increase as the most powerful Kelvin Wave on record continued its progress into the Eastern Equatorial Pacific. According NOAA’s recent April 13 assessment, the massive slug of anomalously hot Pacific subsurface waters continued to surge eastward, to deepen the 20 C isotherm and to spread out on or just below the surface. A significant downwelling oceanic Kelvin wave that was initiated in January greatly increased the oceanic heat content to the largest March value in the historical record back to 1979 and produced large positive subsurface temperature anomalies across the central and eastern Pacific. Extraordinary temperature departures in the range of 4-6 C above average stretched from a zone from 180 West Longitude to 80 West Longitude and ranged in depth from 30 to 70 meters. This very large zone of above average heat shattered global records even as it slid into position to begin re-delivering that excess to the atmosphere. Perhaps more importantly, the nose of this wave of far warmer than normal water had begun to sag, pushing the 20 C isotherm deeper into the Eastern Pacific even as cooler water from the depths began to punch into the tail of the record hot Kelvin Wave, raising the 20 C isotherm in the Western Pacific. This downwelling force of a monster Kelvin wave appears to just now be initiating the start to a global weather-altering El Nino. In the East, from 12 February to 13 April, the 20 C isotherm had plunged from about 25 meters below to around 100 meters of depth. During the same period, the isotherm from about 150 East Longitude to 170 West had risen from about 210 meters to 170 meters. At the subsurface, a continued rising of the isotherm in the West and its continued fall in the East would complete the transfer of warm waters across the Pacific and open the flood gates to the start of what could be an extraordinarily strong El Nino event as what is now a record Pacific Ocean heat content starts bleeding back to the atmosphere. On the surface, trade wind weakening and reversals continued with a significant, though milder than those seen in January and February, backflow emerging in early April east of the Solomon Islands and coinciding with rather weak trade winds across the Equatorial Pacific. Such conditions continued to provide surface impetus to transfer warm waters across the Pacific even as record subsurface heat continued its transition eastward. Accordingly, predictive forecasts both by NOAA and Australia’s Bureau of Meteorology are showing increasing potentials that El Nino will emerge. NOAA’s forecast now indicates that the chance for El Nino has jumped to over 50% by this summer and to 66% by the end of the year. Australia’s forecast is now showing a greater than 70% chance of El Nino over the same period. In addition, El Nino type influences are already beginning to appear in world weather systems. A recent report by Dr. Simon Wang found that precursor El Nino conditions combined with effects related to climate change such as Arctic sea ice loss to spur and enhance epic drought conditions in California. Southeast Asia is already experiencing heat and dryness that is typically associated with a developing El Nino. Northern Brazil is also seeing increasing levels of heat and drought. To the North, Siberia is experiencing an extraordinary April onset to fire season while the northeastern US is somewhat cooler than average due to the persistent and anomalous strength of a dipole of warm temperature extremes in western North America and cool temperature extremes in eastern North America. Many of these impacts, though expected in a normal El Nino year appear to be enhanced by effects related to human caused climate change such as sea ice loss and an amplification of the hydrological cycle increasing the frequency of extreme rainfall, drought and fire events (as in the California drought and the southeast Asian and Siberian fires). During a typical strong El Nino year, global weather disruptions can cause severe damage resulting in reductions to world GDP by as much as 5%. But with the added and enhanced severe weather effects due to climate change interacting with El Nino, overall impacts could be far more destructive. In addition, a release of what is currently record Pacific Ocean heat content into the atmosphere will likely set off new high temperature extremes, further pushing the global climate system toward the very dangerous 2 C warming threshold. Dipole. It’s a word often used among meteorologists and climate scientists. But what does it mean? In weather terms we can simply think of it as this: one side hot, one side cold. So, as a basic principle, it’s pretty direct. But in a world where extremes between hot and cold are becoming more intense, in North America which has just experienced its most extreme dipole anomaly since record keeping began in 1960, it’s also something that’s important to understand as it relates to ongoing human-caused climate change. For a recent blockbuster scientific paper by Dr. Simon Wang and associates and published in Geophysical Research Letters has now linked this extreme temperature differential, related polar vortex collapse events, and the California drought with both ongoing physical changes to the Earth System due to human caused climate change and to the first rumblings of a monster El Nino in the Pacific. But to understand how an excessively extreme dipole relates to the historic events of the winter of 2013-2014, it helps to open up one’s imagination. It helps to describe the ground-breaking information provided by Dr. Wang’s new paper in descriptive terms. It helps to, at first, envision a wave. Then to imagine the up-slope of the wave forming a hot, red shape. Now imagine the down-slope forming a cold, blue shape. Now think of this wave growing more intense, extending further in both its up-slope and in its down-slope. Growing hotter on the up-slope side and comparatively colder on the down-slope side. Having established the wave form and related temperature extremes, lay the shape over North America and adjacent Pacific Ocean. The up-slope covers the Eastern Pacific, Alaska, a section of the Beaufort Sea in the Arctic, Western Canada and the Western US. The down-slope swings from the eastern side of the Beaufort, on in through Central and Eastern Canada and bisects the US diagonally from the Dakotas to the Gulf Coast east of Texas. Now let’s envision this wave as a flow of upper level air called the Jet Stream and let’s think about the various atmospheric aspects that feed it. Looking west, we happen upon a very warm pool of water in the Western Pacific east of the Philippines. This warm pool is the source of an El Nino that will likely occur within one years time. A heat pocket given added intensity by both rising atmospheric temperatures and strong winds transferring that added energy into the vast Pacific Ocean. The heat waits, wanting to spread out across the Pacific surface in an energetic return to the air. But, for now, it simmers in its deep pool, providing energy for the powerful dipole we’ve just described. The heat from this warm pool radiates into the atmosphere creating lift. Further north, a cold pocket is driven south by another strong atmospheric wave pattern over the Asian continent. The cold air pocket runs south over Japan. The hot and the cold difference generates a very strong upper level synoptic (horizontal form weather patterns stretching more than 1,000 kilometers) wind pattern that stretches all the way across the Pacific Ocean. The winds run southwest to northeast until they encounter the hot bulge of our already described dipole over the Eastern Pacific near the US west coast and Canada. This warm current turned the already rapid winds due north where they rushed up over Alaska and into a sea ice pack far weaker than in decades past. A sea ice sheet gradually thinning, breaking up, and venting heat from a warming Arctic Ocean below. And so these, already strong, winds were not turned back by the now much weaker cold until they had driven far, far into the Arctic Ocean (and it is here that we must give a hat tip to Dr. Jennifer Francis, who finds her predictions regarding sea ice loss and high amplitude Jet Stream waves again validated). Now imagine a strong dome of high pressure forming in the wake of this powerful and ongoing wind flow, sheltered and growing ever stronger on the hot side of the dipole. Imagine it blocking the path of storms, even as it concentrated heat and warmth. Imagine California receiving 1/4 or less of its typical winter rainfall as a result. A most recent and extreme insult to years of drought forcing authorities to ration water in many places. Now return to that strong wind finally being turned south somewhere in the far, far north, in the Beaufort Sea just south of the North Pole. Then imagine these now cold-laden winds rushing south. Running over Hudson Bay and eastern Canada. Roaring over the Great Lakes and carrying with them a cyclone of cold Arctic air that should have remained in the far north. The polar vortex that should have stayed over places like Svalbard but instead collapsed under the warm wind flow and shifted far south to places like Toronto or Chicago or Detroit or Washington DC. Now at last imagine another synoptic pattern as the Arctic air of the polar vortex encounters the warmth of the Gulf Stream. This pattern is laden with powerful storms that bomb out over the UK again and again, resulting in the stormiest winter for that island nation in over 200 years. And here we have the dipole of the winter of 2013 and 2014. A west coast that was hot, hotter than usual all the way from California to the far north of Alaska and an East Coast that from Canada to the Gulf Coast became the repository for cold, cold Arctic air that was shoved south as the polar vortex collapsed down the steep face of the one of the largest and longest lasting Jet Stream waves on record. Dipole. One side hot. One side cold. But, in this case, in the case of the winter of 2013-2014, it’s a historic and anomalous dipole. A freak born of the climate change we’ve caused mixing up with the Pacific Ocean heat of a rising El Nino. A record hot, dry winter for the US West that ignites wildfires in winter and forces the government to ration California water resources. 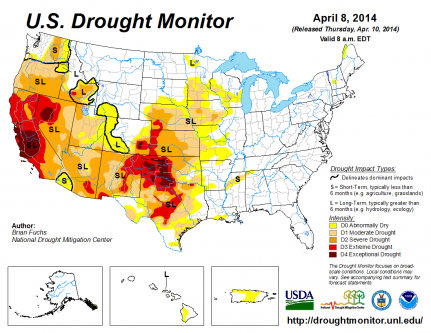 A severe dry spell that closes farms and drives US food prices up by 15%. A record cold, stormy winter in the Eastern US and a series of super-intense storms screaming across the North Atlantic to submerge Somerset and rip massive chunks out of a rocky UK coastline. This clear picture of a climate-change caused event was this week provided through the groundbreaking new research by Dr. Wang and fellows. These top scientists engaged climate models and analyzed past records to find the culprits of the weather extremes we witnessed during this past winter. And what they found was a very high correlation in the models with the extreme dipole over North America and the Arctic, an oncoming El Nino, and climate change driven impacts. For not only was this year’s dipole the most extreme on record, it was also likely made far more extreme by an emerging Monster El Nino acting in concert with severe global-warming related reductions in Arctic sea ice cover, increases in Pacific Ocean heat and atmospheric moisture content, and related changes to the upper level air flows of the Northern Hemisphere polar Jet Stream. Siberia. A land that, during the 20th Century, typically remained locked in ice well into early June. A land where a typical April was still more cold and harshly frozen than the rest of the world in winter. But, over recent years, Siberia has been experiencing earlier and earlier thaws as average temperatures for the region jumped by about .4 degrees Celsius each decade. As the land’s permafrost began to draw back, it unlocked billions of tons of a peat-like under-layer. Organic material sequestered over hundreds of thousands of years of freezing conditions. In moist areas, this carbon-rich layer produced methane gas as it thawed. In dry areas, its moisture steadily leeched out, creating a zone of highly combustible material beneath Siberia’s grasslands and forests. By the mid-2000s enough of these flammable zones had been liberated to result in an increasingly severe fire hazard for much of Russian Siberia. At that time, a series of rather dangerous and intense fire seasons began to set up from late May to early June. Seasons that raged throughout summer and, in some years, produced clouds of smoke that blanketed large sections of the Northern Hemisphere. This year, the situation is markedly worse. A persistent high amplitude ridge in the Jet Stream has funneled heat up from China and Central Asia on into Siberia all throughout late winter and into early spring. The result was summer-like temperatures for a large section of Siberia during late March and into early April. This abnormal warmth set off an early thaw for large sections of Siberia and with that thaw has come an intense, far too soon, ignition to fire season. To the west, Russia may well be embroiled by the conflict in the Ukraine. But the real battle is likely to be with heat and fire. And it is a battle already joined a month and a half earlier than expected. For by April 1, more than 2,000 hectares had erupted into wildfires. By April 9, more than 61 fires and 18,300 hectares were involved before firefighters contained them. 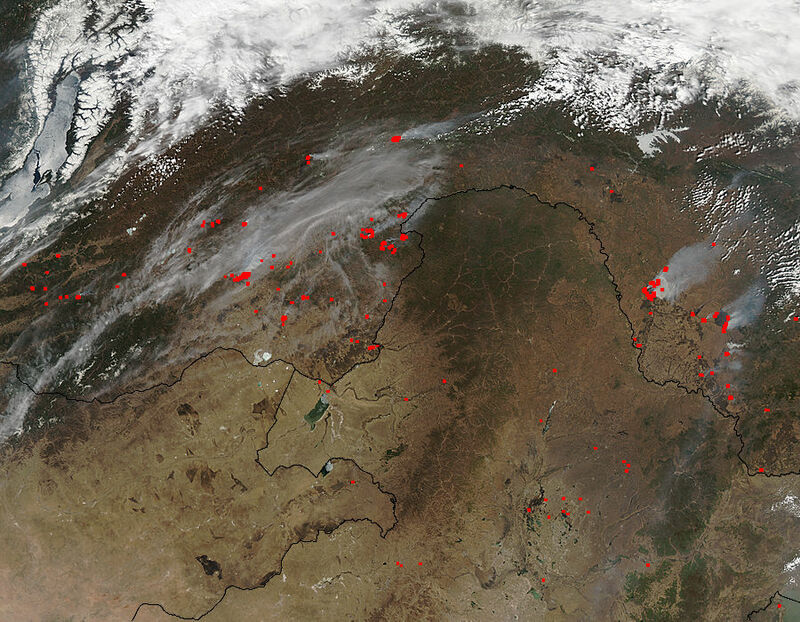 The blazes by April 15 had re-emerged in more violent form on the outer edges of Siberia — in the southern Yakutia region of Russia and in the Amur region, which experienced both epic floods and fires last year. 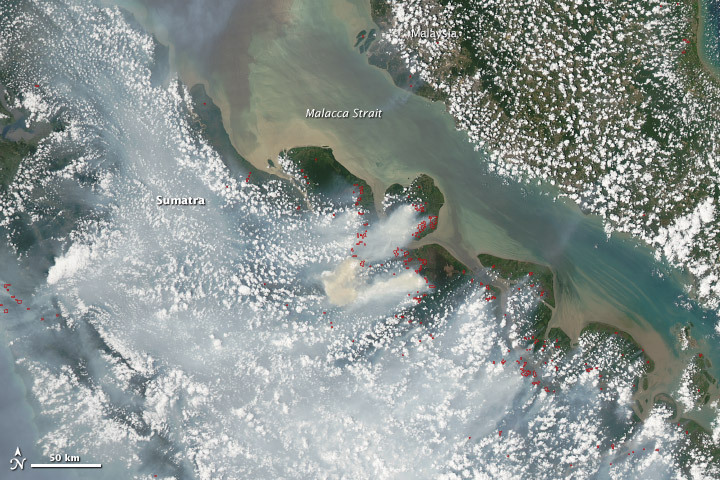 The massive burn scars in these zones and huge plumes of smoke are now plainly visible in MODIS satellite imagery below. These various fires are now quite extensive, a single region featuring burn zones that likely cover an area more widespread than all the fires of a week before. The blackened scar of the largest fire here appears to blanket a zone of about 55 square miles, a region the size of a large city, or a single fire that alone burned through another 14,000 hectares. Visible estimates of the size of fires in the region depicted above are around 20,000 hectares, enough to more than double the area burned last week, bringing the incomplete total to around 38,000 hectares. 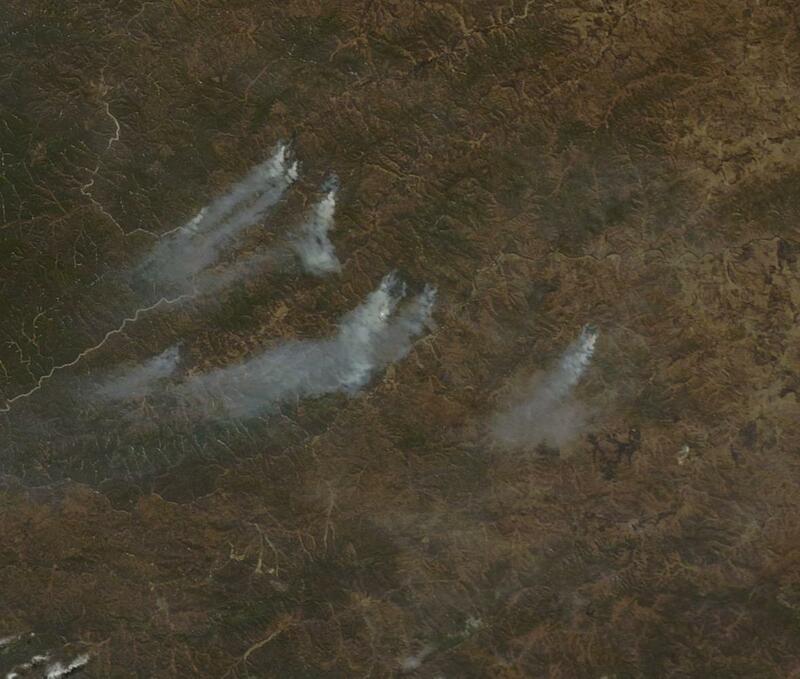 Russian reports, so far, haven’t confirmed the extent of these blazes, but when combined with totals from last week’s outbreak, they appear to be about twice as widespread as fires during the early and epic season of 2012 which, by April 15 had seen about 19,000 hectares burn. As of early April, the blazes were enough to have drawn the emergency response of a small army of fire fighters. And by April 9, about 500 firefighters, scores of vehicles and multiple aircraft were engaged. But this early firefighting force is likely to seem small compared to the numbers that will be needed to combat infernos as the already anomalously warm and dry season continues to progress. Feeling impacts from a broad range of stresses including widespread heat and drought from the US West, to South America, to Australia and Southeast Asia, the ongoing Russian invasion and destabilization of breadbasket Ukraine, and the growing threat of a strong El Nino emerging in the Pacific, world food prices made another significant jump during March of 2014. According to the UN Food and Agriculture Organization (FAO), global food index prices surged from a value of 208 in February to 212.8 in March. The 4.8 point increase from February to March followed on the heels of a 5.5 point increase between January and February. Values above 210 are considered to result in enough stress to ignite conflict as an increasing number of regions begin to see scarcity from lack of ability to purchase or produce food. For the time being, these prices remain below the 2011 high water mark of 229 which was linked to a broad eruption of conflict and food riots from Libya to Egypt to Syria and throughout a smattering of other impoverished or vulnerable regions in Asia and around the globe. But with the world climate situation worsening, with chances for a strong El Nino emerging later this year increasing, and with global conflict over dwindling and endangered stores of food-related wealth and resources intensifying, there remains a substantial risk that global food prices will continue to see strong upward pressure throughout 2014, pushing and maintaining levels high enough to continue to ignite instability, unrest and, in some cases, open warfare. Western US: March saw a brief weakening of the, now 13 month long, blocking high pressure system off the US west coast. This slight interlude unleashed an extraordinary surge of Pacific Ocean moisture that set off record floods and one-day rainfall events throughout Northern California, Washington and Oregon. Pulses of moisture did briefly touch the US Southwest, but the Jet Stream configuration had shifted somewhat northward, resulting in less water relief for the most drought stressed zones. As a result, the epic California drought is probably still the worst seen in 500 years and is now likely to intensify and/or persist on into late this fall. By April 1, snow cover had fallen to 25% of a typical average for the Sierra Nevada. Combined drought and water shortages have led to an unprecedented complete cut off of federal water supplies to many local farmers. In addition, Silicon Valley, has been forced to ration its drinking water supply. Meanwhile, sections of Texas have experienced their driest 42 month period since record-keeping began in 1911. Regions near Lubbock received only 33 inches of rainfall in the three and a half year period since October of 2010. A normal rainfall for this zone would be around 64 inches for the same time-frame. This makes the current 4+ year Texas drought worse than any previous dry time during the 20th Century, including the Dust Bowl period of the 1930s. With the emergence of spring, a typical post-winter dry period will likely be enhanced by a continued formation of a powerful dome high pressure system blocking moisture flow to California and the US Southwest. In addition, amplified heat in the up-slope of a high amplitude Jet Stream wave will likely drive drought conditions to rapidly worsen as spring runs into summer. Sadly, the primary hope for moisture comes from the emergence of El Nino, which is becoming more and more likely for later this year. However, if the El Nino comes on as strong as expected, rainfall events are likely to be extraordinarily intense, ripping away top soil from the likely fire-damaged zones and making it difficult for water planners to capture and store water due to its velocity. In the worst case, Ark Storm-like conditions could emerge due to a massive heat and moisture dump that could result in very intense rivers of moisture forming over western regions. Brazil: Ever since 2005, Brazil has been suffering from a series of persistent drought episodes. By this year, the nine year long drought series reached an ominous peak. Like California, this drought series is now likely the worst seen in decades and possibly as far back as 500 years. The result was widespread fires and blackouts throughout Brazil together with extreme impacts to farm production. Particularly hard hit were coffee and sugar production, sending prices for both markets rocketing to record or near-record levels. Indonesia and Southeast Asia: From Thailand to Malaysia to Indonesia, drought resulted in significant reductions in palm oil production, a main crop for the region. Throughout March and into April large fires were reported over a wide drought-stricken zone even as smoke choked both cities and countryside. Some of the fires were suspected to have been illegally set by large palm oil conglomerates seeking to clear new land for an ever-expanding set of palm oil plantations. But the plantations may now be in danger of a drought fed by both their destructive practices of land-clearing and by their overall contribution to an extraordinary and excessive global greenhouse gas overburden. Drought related heat and fires not only threatened crops but also resulted in multiple school closings, numerous dangerous air warnings, thousands of calls reporting peat fires and, in Indonesia alone, more than 20,000 people hospitalized for respiratory problems. The Ukraine and Russia: An ever-more expansionist Russia’s invasion of the Ukraine also resulted in higher food prices as speculators purchased grain stores over projections that Russian forces could disrupt Urkaine’s food production and exports. First phase invasion into the Crimea did not block key grain ports. But tens of thousands of troops massed along the Ukraine border and likely continued incursions by Russian special forces units into Eastern Ukraine resulted in an ongoing destabilization of one of the world’s key grain producers. In this context, it is worth noting that global harvest figures showed Russian wheat production falling from 61 million metric tons per year in 2009 to 38 million metric ton per year in 2012. Throughout this four-year period, Russia has been forced to curtail or cut off grain exports on numerous occasions as increasing periods of drought, fire and extreme weather resulted in loss of crops. Meanwhile, wildfire season began early in Siberian Russia perhaps presaging a fire season that, when combined with the effects of an emerging El Nino, could be the worst seen since 2010 when Russia first cut off grain exports to the rest of the world. Global Problem: Though the above list provides examples of where global food supply is most threatened by extreme weather related to climate change and/or a related set of conflicts over resources, it is important to note that the current food, resource, and climate crisis is now global in nature. Droughts and severe weather have left almost no region untouched and now result in substantial damage to crops at least once a year in even the most tranquil locations. Instances of ongoing and systemic drought are now common throughout various areas not mentioned above including: Australia, China, South America, Central America, The Middle East, Africa, India, and sections of Russia and Europe. So though blows to important “bread baskets” provide the most impact to overall food price and availability, a general state of agricultural disruption due to increasingly extreme climates blanketing the globe result in a far more challenging than usual base-line for food producers and consumers everywhere. Thirsty West: Where’s the Snow? According to NASA’s Global Land-Ocean Temperature Index, overall average temperatures for the month of March, 2014 were .69 to .7 degrees Celsius hotter than the 1951 to 1980 average. As a result, last month was the third hottest March in the global record since 1880. 2002 was ranked first hottest with 2010 as second hottest. Nine of the ten hottest Marches on record have occurred since 2001. Ten of ten have occurred since 1998. A wide zone of extraordinary temperature anomalies ranged throughout Siberia and the Arctic during the month with 4-8 C above average readings stretching along an enormous swath from Germany in the west to Yakutia in the east and from China in the south and on up to the North Pole. Large warmer than normal air pulses progressed from China northward over broad sections of Russia and Siberia throughout the month. These pulses harmonized with persistent high amplitude Jet Stream ridges over Eastern Europe to draw much warmer than average temperatures northward. By early April, these conditions had translated into 70 degree (Fahrenheit) values for some sections of Siberia, where the annual fire season had an ominous, very early start for the Amur and the Baikal — Russian regions that are typically still locked in ice this time of year. Overall, by April 6, more than 2,000 hectacres of fires had been reported by the, justifiably, very concerned Russian officials. Temperatures in the Baikal and Amur regions were particularly hot with measures in late March and early April shattering previous temperature records by 2-9 degrees Celsius for the cities of Novosibirsk, Tomsk, Kemerovo, Barnaul and Gorno-Altaysk. Overall, this region of Russia has shown a very rapid pace of temperature increase: about .4 C per decade, or more than double the global average. NASA zonal anomaly maps also continued to show evidence of an extreme polar temperature amplification in the Northern Hemisphere. Such high degrees of heat amplification at upper latitudes were a predicted result of human greenhouse gas emissions. Yet one more climate science prognostication that has borne out. There’s a tale in the ice. A record of past atmospheres locked away as snowfall trapped air bubbles and then compressed them into thin layers age after age over tens of thousands of years. Over the last few decades, scientists have been drilling holes in the great ice packs of Greenland and Antarctica. Their quest? To unlock this tale and reveal a direct record of global greenhouse gas levels through the deep past. What their drilling uncovered was both quite informative and rather chilling. First, it showed that, for more than 800,000 years, global CO2 levels had been relatively stable in a range of 180 to 300 parts per million. As the levels of heat trapping CO2 rose, temperatures peaked during brief interglacials. And as levels fell, temperatures plunged back into ice age conditions. Global temperature flux during these swings from ice age to interglacial were just 4 degrees Celsius. 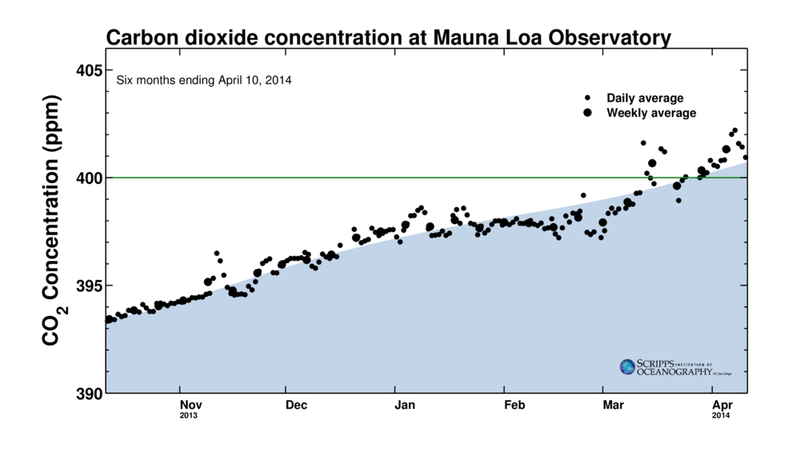 A 100 ppm CO2 rise correlated roughly to a 250 foot rise in sea level and much warmer average conditions globally. A corresponding fall of about the same amount brought temperatures back down and piled ice two miles high over today’s temperate regions such as New York. What the ice cores also revealed was that human CO2 emissions had pushed global levels of this potent greenhouse gas far out of any climate reckoning comparable to the context of human beings, who have only existed in current form for about 200,000 years. This record was a key contribution to climate science. One, it revealed how past CO2 levels compared to past temperatures. And since the data was directly derived from air bubbles trapped beneath hundreds of feet of ice, it also provided us with an exact measure for past atmospheres. Secondly, and perhaps much more ominously, it showed us how very far beyond any climate comparable to that great span of time we’d already come. Humans have now pushed the CO2 boundary 102 parts per million higher than the context provided by the last 800,000 years. 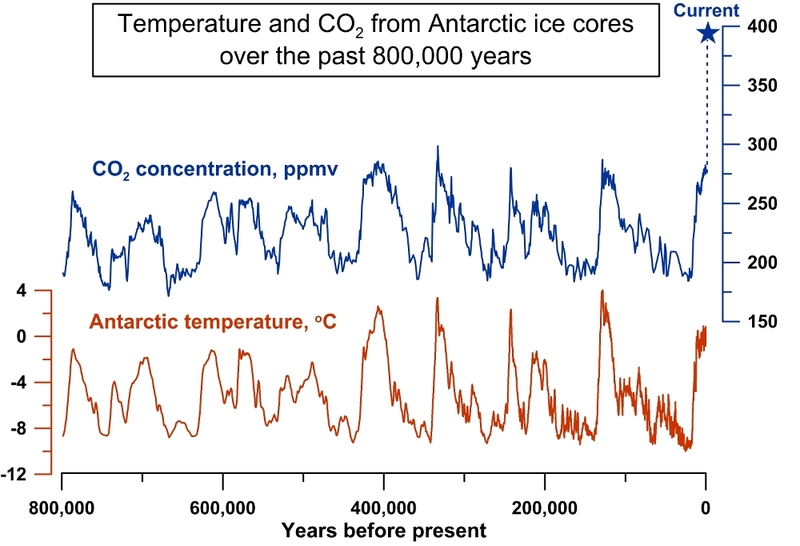 It’s kind of a big deal when you consider that a mere fluctuation of about 100 parts per million CO2 was enough, when combined with changes in orbital forcing, to set off feedbacks resulting in a 4 C temperature change globally (8 C change for the Antarctic environment) as ice age proceeded to interglacial and back. Current human forcings through CO2 and other emissions have now entirely over-ridden the natural cycle, eliminating the possibility for future ice ages and putting us on a trajectory for catastrophe. With annual global carbon emissions now exceeding 12 gigatons, not only have we forced ourselves well outside of any past bounds to which we can easily relate, we have also generated an unprecedented velocity of change. For the current human carbon emission now exceeds, by at least six times, the most rapid past level of natural carbon emission. No vast flood basalt could ever rival the volume and pace at which humans currently emit greenhouse gasses. This enormous emission continues to have severe effect through an ever-higher ratcheting of global CO2 levels. This an extraordinary measure. One that has no context in direct records such as those available to us through ice core data. But paleoclimate proxy data does provide some corollary. According to isotopic carbon measures found through seabed samples, we can determine that the last time CO2 levels were above 400 parts per million was during the mid-Plieocene between 3 and 3.3 million years ago. And during that time global average temperatures were 2 to 3 degrees Celsius warmer than they are today (with Antarctic values at least twice that). 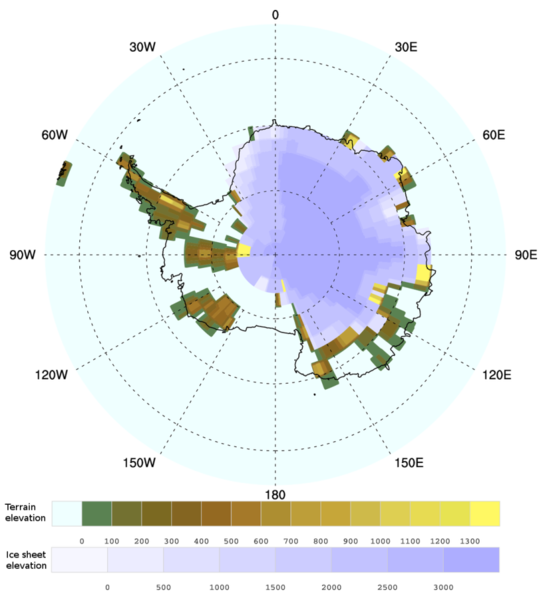 Both Greenland and West Antarctica were mostly ice free and sea levels were between 15-75 feet higher. These are, likely, the potential low end of the changes we’ve locked in due to human global greenhouse gas forcing long term, even if, somehow, global CO2 levels are brought to a plateau. Unfortunately, the global CO2 measure doesn’t tell quite the entire story. For atmospheric levels of gasses like methane, nitrous oxide, and a host of less common industrial chemicals have also all been on the rise in Earth’s atmosphere due to human emissions. As a result, according to research by the Advanced Global Atmospheric Gasses Center at MIT, total heat forcing equal to CO2 when all the other gasses were added in was about 478 ppm CO2e during the spring of 2013. 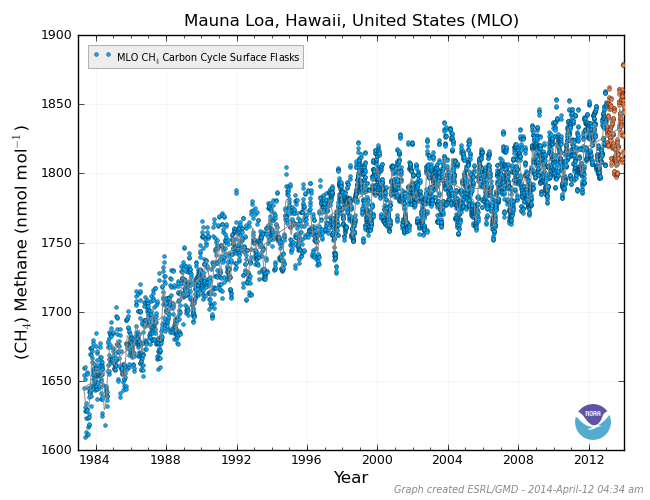 Adding in the high-velocity human greenhouse gas contributions since that time gets us to around 480 ppm CO2e value. In the context of past climates and of near and long term climate changes due to human interference, 480 ppm CO2e is nothing short of fearsome. The last time the world saw such a measure of comparable atmospheric greenhouse gas heat forcing was during the Miocene around 15-20 million years ago. At that time, global temperatures were 3-4 C warmer, the Antarctic ice sheet was even further diminished, and sea levels were 80-120 higher than today. This combined forcing is enough to result in a state of current climate emergency. In just a few years, according to the recent work of climate scientist Michael Mann, we will likely lock in a 2 C short term warming this century and a probable 4 C warming long-term. If the current, high-velocity pace of emission continues, we will likely hit 2 C warming by 2036, setting off extraordinary and severe global changes over a very short period. These are very dangerous and, likely, catastrophic levels. In such a context, the inexorably rising rate of atmospheric CO2 and other greenhouse gas forcings simply adds further insult to a very high risk situation. Very powerful near Category 5 Ita is now bearing down on the Australian Coastline. Regions near where the center makes landfall, projected to be near Cape Flattery, could experience 155 mph sustained winds with gusts in excess of 185 mph and storm surges in excess of 25 feet. Interests throughout North Queensland should remain abreast of what is a very powerful and dangerous storm capable of producing record or near record effects. 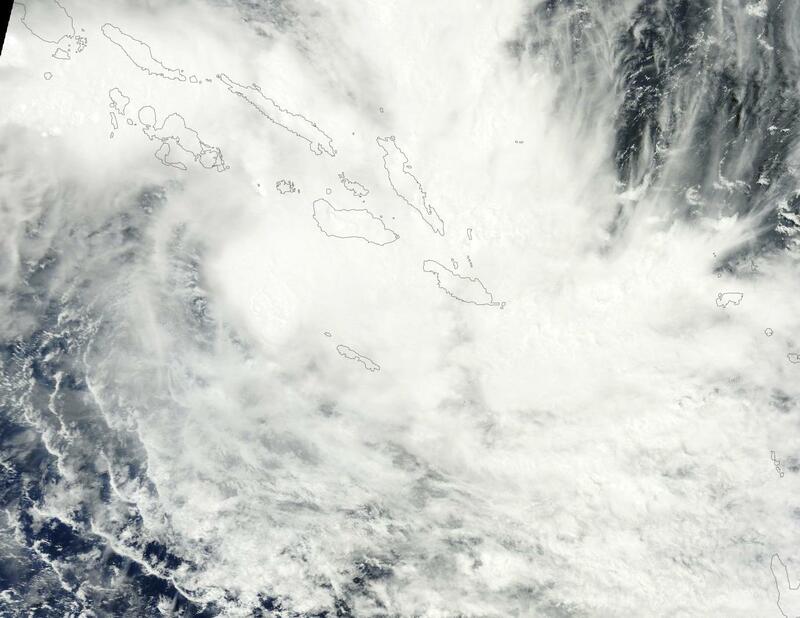 An outrider of an El Nino pattern that appears to be gradually emerging and strengthening in the Tropical Pacific, Ita had her stormy beginnings near the archipelago of the Solomon Islands. There, what at first started as a tropical disturbance dumped three days of torrential rainfall over the island chain, setting off worst-ever floods on record, washing away hundreds of buildings, and leaving more than 50,000 people homeless. Major rainfall events are not uncommon in the Solomons. But what occurred as a result of current and abnormally intense heat-spurred Pacific Ocean convection is. For the massive shield of thunderstorms that spawned Ita also dumped one meter (1000 mm or 39.4 inches) of rainfall during a three day period over some sections of this tropical island chain. The far-reaching floods ruined roads, bridges, buildings and forced the cessation of strip mining operations in interior sections. The Solomon Islands lie just east of New Guinea and are on the southern edge of what is currently a very deep, hot pool of water — one that appears to be in the process of rushing eastward. There, over waters ranging from 85 to 87 degrees Fahrenheit (29-30 degrees Celsius, or about 1-2 C above average), Ita had her genesis in a shield of convection forming along the hot pool’s southern flank. After lingering for days over the Solomons, Ita gradually shifted southwestward, churning on into the Coral Sea and reaching category 1 intensity by April 8th. Water temperatures throughout the region remained well in excess of 80 degrees, more than enough to fuel rapid intensification. By late April 9th, many models showed Ita potentially reaching category 4 or 5 intensity before roaring into northern Queensland. Concerns were raised about both projected storm intensity and projected track. Clockwise circulation of a slow-moving but very powerful storm could pile a very significant storm surge along the Queensland cities of Port Douglas and Cairns. Northern locations could experience very intense and prolonged storm conditions including heavy rainfall, extreme coastal flooding, and winds in the range of 90 to 155+ mph over a tightly compact zone. Cape Flattery, Cooktown and Port Douglas, sparsely populated towns of between 2,000 and 3,000 residents, respectively, are likely to bear the brunt of the storm. But Cairns lies only a little further south along the storm track and boasts fully 150,000 residents — a more densely populated region that could also see extreme impacts. By early April 10th, favorable environs and extremely warm water temperatures in the Coral Sea had resulted in the rapid intensification predicted. By 1600 Eastern Time in the US, Ita had bombed out to a 155 mph monster storm with a lowest central pressure around 921 mb, exploding from a Category 1 to a near Category 5 storm in less than 48 hours, as it headed toward the Australian coastline at an excruciatingly slow pace of 6 mph SSW forward motion. It’s worth noting that a 921 mb reading is very low and may justify a new winds speed of closer to 165 mph or more considering how compact this storm. Early model runs had projected peak intensity at 920 mb and around 165 mph wind speeds. That said, ITA remains over open water and retains a very compact wind field, so further intensification is possible before land interference begins to disrupt circulation. Even now, conditions may seem disturbingly tranquil along the coastline. Winds there are currently running in the range of about 20-30 mph. But gale force winds lurk about 100 miles offshore and the intense, hurricane force, winds are not fare behind. The most intense winds, of up to 155 mph sustained with 185 mph gusts, are in a tight band just about 10-20 miles from the center. It is regions within this band of clockwise onshore flow where most damaging effects are likely to be witnessed. Ita is expected to maintain Category 4-5 intensity all the way through to land-fall sometime tomorrow. As such, storm surge flooding in excess of 25 feet is likely near where the center makes landfall. A storm of similar strength, Typhoon Mahina, brought a 45 foot storm surge ashore near Bathurst Bay in 1899. It is the same region where Ita is expected to make landfall sometime tomorrow. This storm surge of 45 feet ties Bangladesh for the highest storm surge on record anywhere in the world. Mahina made landfall with a minimum central pressure of 914 mb. Ita would only need to drop another 10 mb to exceed that mark. But, if it does, a world storm surge record could be set to fall. UPDATE: Ita shows some slight weakening in both satellite and pressure estimates. Pressures (NOAA) as of about 7 PM were around 926 mb with maximum sustained winds still estimated in the range of 150 to 155 mph. Australia’s Bureau of Meteorology maintains ITA at 907 mb and CAT 5. Still a very powerful storm. UPDATE: As of 9 PM EST, US, Ita continued to show some signs of slight weakening. 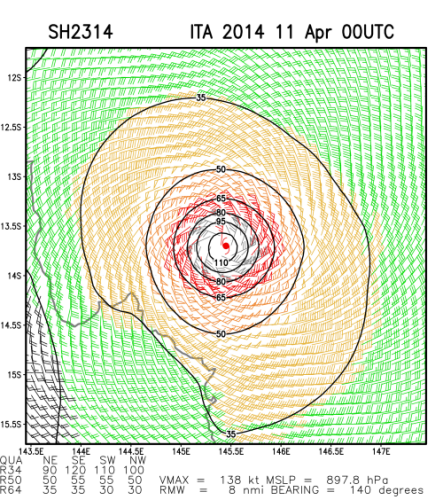 NOAA now shows Ita as a 931 mb storm, while Australia’s Bureau of Meteorology puts it at 914 mb. No cause for comfort, as yet, since these pressure estimates are well within the range of a strong CAT 4 or CAT 5 storm. Perhaps more ominous, however, is a slight job to the south. Too early to call but if a more southerly track continues, locations such as Cairns may be in for more of an impact. Still too early to call. As per the recent VMAX wind profile Ita’s gale force winds are now on shore. Measurements are in knots. In this measure maximum sustained winds are just into CAT 5 status (138 kts). Image source is NOAA. UPDATE: Slow strength degradation continues pushing Ita into strong CAT 4 status. NOAA shows 937 mb and ABM shows 922 mb at 11 PM. Wind strength remains between 145 and 150 mph max sustained. Southward jog continues as it appears possible Ita may skirt the coast. UPDATE: Ita came ashore as a Category 4 storm with effective one minute sustained winds in excess of 135 mph and a ten minute sustained wind of 120 mph near Cape Flattery in Queensland. Pressures at landfall were in the range of 935 to 948 mb. 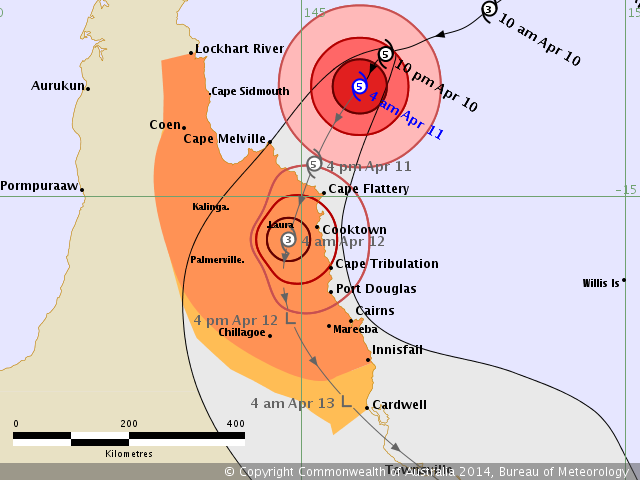 Ita has continued to track just inland and is now just west of Cooktown. Interaction with land has continued to degrade Ita, which as of 12 PM EST was estimated at Category 3 intensity.